Cruise along the stunning Maui coastline! Get the chance to see dolphins in the wild with this Dolphin Discovery Snorkel Adventure. Your morning begins with a delicious tropical continental breakfast. Keep your eyes peeled during this time, as you may have the chance to encounter amazing giant green sea turtles just outside the marina in Ma'alaea! Then head past Dolphin Cove, where Maui's resident pod of Spinner Dolphins live. Please Note: Snorkeling sites are chosen the day of your tour depending on weather conditions. Location possibilities include: Molokini Crater, LaPerouse Bay, Kahihinu, Offshore-Kaho'olawe, Turtle Arches and Coral Gardens. Accessibility: This vessel is not wheelchair accessible. Amenities: The Maui Magic features a BBQ Grill, tiki bar, waterslide, galley, upper deck, restroom (marine head) onboard. There is not a whole lot of shade but there is an awning that can be pulled up over the seats at the 2nd snorkel spot, but while under way, shade is limited. Storage is available below the seats to stow away any personal belongings you may wish to bring aboard. Tropical Breakfast: Local Kona Coffee, Tea, Hot Chocolate, Juice (Passion Orange Guava), an assortment of Muffins plus a Tropical Fruit Platter. Mid-Morning Snack: An assortment of raw vegetables including: Carrots, Celery, Broccoli served with a Ranch Dip. Along with Maui Potato Chips. BBQ Lunch: Cooked fresh and hot onboard! Choice of Hamburgers, Cheeseburgers, or Veggie Burgers served with a Sesame Seed Bun and all the trimmings (grilled pineapple slices, cheese, tomato, onion, lettuce), we also offer Hot Dogs, and Maui Potato Chips. Want to go “ALL IN” ask the cook for a “Maui Wowie” you won’t be disappointed. Dessert: Make sure to save some room for some Fresh Baked Cookies! Beverages: Sodas (Coke, Diet Coke, Sprite, Ginger-Ale), POG Juice, Filtered Water, several varieties of Beer, plus Chardonnay, and a Mai Tai on the way home! There are a limited amount of prescription masks available on a first come, first served basis. 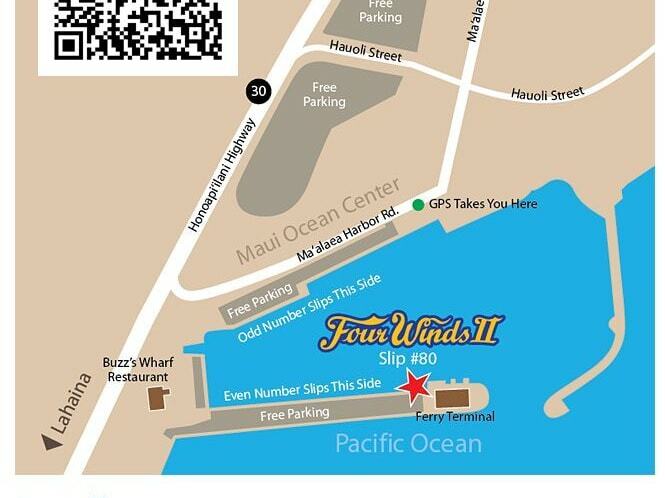 For cruise ship passengers, the distance to Maalaea Harbor is approximately 35 minutes away by taxi. Ma‘alaea Harbor has a metered parking. The cost is .50 cents per hour or $12 for a 24 hour period. *subject to change. Free parking are also available at the outer lots of the Harbor Shops and Restaurants above the harbor. You do see dolphins 70% of the time. By Law, the coastguard does not allow boats to get closer to dolphins than 50 yards. You may be lucky and have a dolphin swim close whilst snorkeling but they cannot purposely or intentionally allow you to swim amongst them. No, you are not required to be able swim. You are welcome to stay on the boat or grab a flotation device to hold on to. We recommend booking at least 2-3 weeks in advance. If you have very specific schedule requirements and are not flexible, please book sooner. Last-minute bookings are often possible, but availability is limited. What are the boat specifics? The boat is a brand new and state-of-the-art Catamaran built for comfort, spaciousness and safety. Although licensed to hold 71 passengers, for your maximum comfort, only a small group of no more than 45 passengers are booked at any one time. It has two dual engines for speed and a wave splitter for a super-smooth ride. The vessel also comes equipped with a galley, wet bar, BBQ grills, upper sundeck and covered cabin, restrooms, Wet and Wild waterslide, and swim steps for easy water access. Continental Breakfast: Fresh Bagels with Cream Cheese, Jellies, Tropical Fruit, Kona Coffee & Juices. Deluxe BBQ Lunch Hot-off-the-Grill Hamburgers, Hotdogs and Vegi-Burgers, Crudite Platter with Dip, Maui Chips & Cook Kwee's Cookies.